There’s no lack of ramen joints in the East Village; with no fewer than fifteen restaurants that offer up the tasty Japanese noodle dish in the neighborhood. Ramen Misoya may not have the name recognition (and prices) of an Ippudo a couple blocks away, but Misoya’s ramen is legit. In fact, as of this post, the restaurant has 560 reviews on Yelp with an overall star rating of four. With that quality and quantity, Misoya is easily in the top five of straight-ramen joints in the East Village. 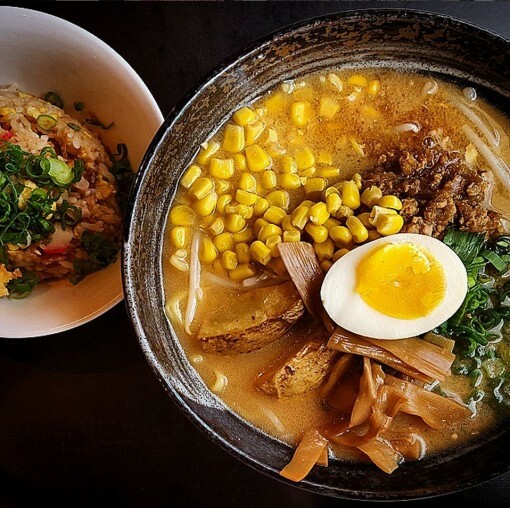 Now that we’ve identified that there’s quality ramen to be had and talked about why others like Ramen Misoya, let’s talk two other reasons to go to Ramen Misoya. First, the service there has always been very friendly. I’ve been to Misoya a handful of times and the staff has always been very sweet and helpful. That’s all I have to say about that. The reason I decided to write this review isn’t solely based on just good ramen and nice customer service, but because of Ramen Misoya’s $10 lunch special. Mondays through Fridays, you’re able to get a large bowl of ramen (choice of kome, mame or shiro) and your choice of a side dish (gyoza, karage chicken, or friend rice) all for a ten spot. I’ve always leave with some food left over. I’ve had the lunch special a couple of times now and still surprised at the quantity and quality you can get at Ramen Misoya for ten smackers. And you know I’m all about the cheap and tasty. If there’s a cheaper and tastier deal for Japanese food in the East Village, please let me know.